Q : How can I find out about routes and departure times? Detailed information on routes and scheduled departures is available through the Schedule and Fares page on this Website. Q : I want to travel on a date not shown on the current schedule pages. Where should I look? If the schedule for your desired travel period is not yet posted on our site, it will be as soon as it is available. Please check in again shortly. Q : How much does it cost to ride the ferries? This varies depending on which route you take. For detailed information on fares, check the Schedule and Fares page on this Website. Q : Do I have to pay for my baby? The infant rate for round-trip transportation to Catalina Island is $5, if your child is under two years old. Q : Are reservations recommended? If I walk up to the ticket counter on the day of my travel, am I guaranteed travel? Catalina Express strongly recommends making advanced reservation for your trip to Catalina Island. 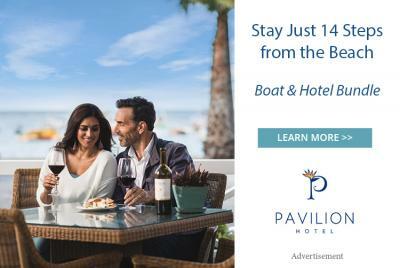 You can book your trip with our reservation agents by calling 800.995.4386 or online at CatalinaExpress.com. Customers who walk up on the day of travel are not guaranteed travel. Q : The temporary password is not working and I already reset it, what can I do? For questions concerning passwords, please call our contact center at 800.995.4386. An agent can assist you with your password and book a reservation for your trip. Q : I want to confirm my reservation, I'm not sure whether it succeeded or not online. My account shows 'No itineraries available', what can I do? Please call our contact center at 800.995.4386. An agent can confirm your reservation and make any changes if needed. Q : I am international customer and I called your phone numbers, but they do not work. I was also unable to book on your website. What can I do? International passengers are sometimes unable to make reservations online or contact Catalina Express by phone. Please email our Passenger Services Representative at mail@catalinaexpress.com who will assist you book a reservation. Q : I have an international mailing address and credit card. I am unable to book on the website. What can I do? International passengers are sometimes unable to make reservations online or contact us by phone. Please email our Passenger Services Representative at mail@catalinaexpress.com who will assist you book a reservation. Q : I am an international customer and would like to order a gift card as a gift. How can I place my order? Unfortunately, at this time, Catalina Express is unable to provide Gift Cards to international customers. Q : I am an international customer and attempting to book online. I receive an error message when I try to pay: "Address verification information is not available. Try another card or call reservation desk." What is happening? This type of notification happens mostly to passengers traveling from outside of the United States. Please email our Passenger Services Representative at mail@catalinaexpress.com who will assist you book a reservation. Q : I cannot call your number. The international calling rates are too high or our time zones do not match. What can I do? International passengers are unable to make reservations online and sometimes cannot contact Catalina Express by phone. Please email our Passenger Services Representative at mail@catalinaexpress.com who will assist you book a reservation. Q : How many people are required to qualify for the discounted group rate? Group rates are offered on a space available basis to any group booking a minimum of 20 adults traveling together round-trip to Catalina Island. Q : Does everyone in the group have to travel together? Yes, in order to qualify for the discounted group rate, everyone in the group must travel together on the same departure and return boats. Q : If I make a group reservation, can each person still pay for their ticket individually? No, the group will assign a Group Leader to handle communication and correspondence between the group and the Catalina Express Sales Associate. This includes submitting one payment to cover all individuals within the group. Q : If I have a group, will we be on our own private boat? No, groups will travel together on regularly scheduled departures and returns with the general public. However, charter options may be offered based upon availability. Q : I left a voice message and/or sent an email to cancel my reservation. Why was I still charged? You may cancel your reservation without obligation, provided you contact Catalina Express over the phone at least 24 hours prior to departure and obtain a cancellation number. Voicemails and emails are not an acceptable form to cancel a reservation. Q : Do I get a refund if my whole party does not show up? You may cancel your reservation without obligation, provided you contact Catalina Express at least 24 hours prior to departure and obtain a cancellation number. Passengers who do not show up on the day of travel will be charged the full amount of the round-trip fare. Q : I was double charged through the mobile site/online website. What can I do to get a refund? 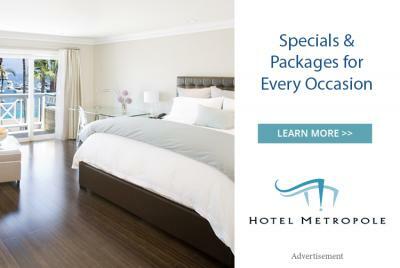 If you receive a double charge while booking online, please call 310.519.7971 and request the accounting department. Q : My bank statement showed that I was charged for my four attempts to book although these transactions were shown as unsuccessful in the website. How can I solve this problem? When charging your credit card for your reservation, Catalina Express was unable to verify the billing address provided. For your security, we immediately void this transaction. You will see this transaction as pending on your account, although it will not actually clear. It is up to your bank how quickly they release your funds. Please allow 3-5 business days for the transaction to be removed from your account. Q : Can you help me find your terminals? While there is plenty of highway signage to guide you to our terminals, we understand that many customers would like more information on how to find them. Please select the below port that you are departing from for more location and parking information. Q : Can I park my car at the terminal? Our terminals all have parking facilities. The parking at all of the terminals are not owned or operated by Catalina Express. Please select the below port that you are departing from for more information about parking. Q : Is parking included in the ticket price? The parking at all of the terminals are not owned or operated by Catalina Express. The ticket price does not include parking. Q : I am disabled and have a handicap plaque; do I receive free parking? Catalina Express does not own or operate the parking at the terminals. Please contact the parking company for the port you are departing from to find out their rules concerning handicap parking. Q : When should I be at the terminal? Check-in time is an hour prior to departure. Reservations are held up until 15 minutes prior to departure. Q : Do I need to print out my reservation confirmation or can I show it on my phone? Printing out your reservation confirmation is highly encouraged to allow for a smooth check-in process. If you are unable to print your confirmation, the ticket agent will still be able to find your reservation as long as you have the confirmation number. Q : Why do you allow only one trip down the ramp? I am traveling with a bike and/or child. Each passenger is allowed one trip down the ramp to control the boarding process. Q : What forms of ID are acceptable at check-in? To check in for your trip to Catalina Island, it is highly encouraged to have a government issued photo ID available. Q : What do I do if I lose a ticket? A new ticket must be purchased for your travel time, all printed tickets are treated as cash. Lost tickets may be refunded by Catalina Express if you were required to repurchase new tickets to travel. Please obtain a Lost Ticket Report form from our ticket offices to submit your refund claim. Please allow 2 to 3 weeks following the end of the 30-day exchange period for your Lost Ticket Report to be reviewed and processed. Submission of a Lost Ticket Report does not guarantee a refund. Q : Do I have to check in if I have a confirmed reservation? Yes. Once you check in, you will receive your printed boarding pass that is required to board the boat. Q : Where do I check in my luggage? Passengers are responsible to bring all their luggage down the ramp and to the boat. The crew will direct you on where to place your luggage. Q : How many fishing poles are allowed per person? Catalina Express allows up to three fishing poles per passenger. They must be bundled in a proper fishing rod case. Q : Why do you only allow one pet per person? Catalina Express allows one pet per person so the owner can handle their pet more efficiently, as well as for the safety of our passengers and other pets onboard. Q : I am traveling with my therapy dog. Do I have to put the muzzle on my dog? Therapy, comfort and emotional support animals all have to follow the standard guidelines of the Catalina Express Pet Policy. When accompanied by a passenger presenting a valid ticket, a pet which is not intended for other persons, nor for sale, may be transported subject to the following conditions: Each dog must be secure in a muzzle, leash and collar or a muzzle and harness sufficiently strong and tight fitting to securely hold the dog and remain leashed and muzzled throughout the trip. A dog muzzle is defined as a commercially manufactured device that fully encloses the “muzzle” portion of a dog’s head. A muzzle must be a multi-strap, pouch or cage design. A single strap muzzle will not be accepted. All other pets must be enclosed in an Airline-style Pet Carrier throughout the duration of the trip. Purses, totes and luggage are not suitable carriers. Catalina Express may impose such conditions on transporting pets as in its judgment are necessary or desirable for the convenience or safety of the passengers. Catalina Express will not assume obligations to store or care for dogs or cats at stations, wharves or on board vessels. No pet or carrier shall at any time occupy a passenger seat and the passenger must be prepared to clean up after the pet in the event of a mishap. If passenger does not abide by the above conditions, passenger will be notified in writing of Catalina Express’ intent to cease or restrict transportation of passenger’s pet. Passenger accepts liability for any injuries or damages caused by passenger’s dog or cat. All passengers with pets will be required to sign a pet waiver. Q : I am traveling with my service dog. What do I need? All passengers accompanied by service dogs will be permitted to take such dogs aboard passenger vessels as necessary for their aid and guidance. Catalina Express requests that you please bring a leash and muzzle with for the trip. Only qualified service dogs can be permitted in the Commodores Lounge. Q : I am traveling with a mobility scooter or wheelchair. Are your terminals and boats wheelchair accessible? All Catalina Express terminals and vessels are ADA complaint for mobility scooters and wheelchairs. Please contact Passengers Services if your mobility scooter or wheelchair is larger than the standard width of a doorway. Q : I am going over to Catalina for a day of diving. What should I know about my equipment and other aspects of my travel? Divers are allowed one additional equipment bag 23”x23”x37”; 50 lbs. maximum and one recreational dive tank or one double with fixed manifold as well as one weight belt or weight bag which is carried on board or worn by passenger and is not inside the luggage. Returning with suits that are wet are not an issue and will be permitted aboard. For more information please visit our Baggage Guidelines page. Q : I am going over to Catalina for a camping trip. What should I know about my equipment and other aspects of my travel? Campers are allowed to transport a sleeping bag as an extra piece of luggage. Read travel tips regarding camp equipment, ice chests, stoves, carts and other typical camp items. For more information please visit our Baggage Guidelines page. Q : I am a construction worker going over to work on a job. What should I know about my equipment and other aspects of my travel? Construction workers may transport the Medium Size Stanley Box, maximum 50 lbs. The largest size of Stanley or Husky Boxes are problematic, they must be under 50 lbs. and be able to be stored on their sides or up on end if necessary. Two-wheel dollies are acceptable. No four-wheel carts or wagons. For more information please visit our Baggage Guidelines page. Q : Is there food and beverage service on the boat? What type of payment is allowed on the boat? All Catalina Express vessels include a galley with a variety of snacks and full bar services. The cabin attendants also come to your seats to offer you a snack or beverage. All major credit cards and cash are acceptable payments on the boat. Q : Can I bring my own food and drinks on the boat? Passengers are welcome to bring and consume their own food and non-alcoholic beverages onto the boat. Personal alcoholic beverages not sold by Catalina Express cannot be consumed on the boat due to Alcoholic Beverage Control regulations. They will have to remain stored with your other luggage. Q : Where is the best place to sit on the boat if I am prone to sea sickness? While we don’t normally sail over rough waters, occasionally it can be choppy once we’re underway. If you are prone to sea sickness, sitting downstairs or outside has been helpful for some passengers. The Catalina Express terminals also have sea sickness medication and wristbands available for purchase. Q : Is there cell service and WiFi on the boat? Your cell service will depend on your provider as some phone last for a majority of the trip and some do not. Catalina Express does not provide WiFi on any of the vessels. Q : What’s the best thing to do on the Island? Catalina Island offer visitors a numerous amount of activities to participate in during their getaway. To best plan you trip, visit our Itineraries page for ideas on how to spend your vacation at . Q : Where do we go to rent golf carts? 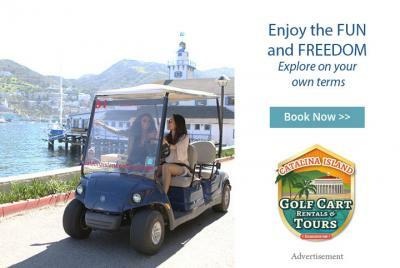 Renting a golf cart is a popular activity on Catalina, so reservations are recommended. Catalina has two golf cart rental companies. Q : Is there a beach/where do I go to snorkel? Catalina Island has some of the best snorkeling in the country. To find out about the best spots, visit one of the many diver and snorkel shops that can outfit you with gear as well. Q : Where do we go to pick up our tour tickets? Depending on the company you have schedules a tour with there are two main locations for picking up tour tickets. Most water tours are on the Green Pleasure Pier and land tours are at the Tour Plaza. The Tour Plaza is located one block from the beach between Catalina Avenue and Sumner Avenue.